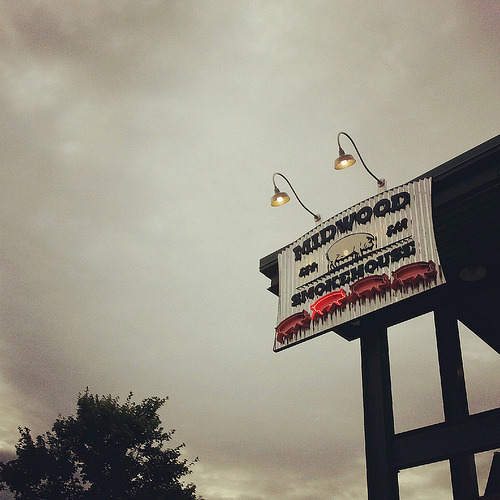 Speedy: When I first heard that Midwood Smokehouse was opening back in 2011, I was pretty skeptical. 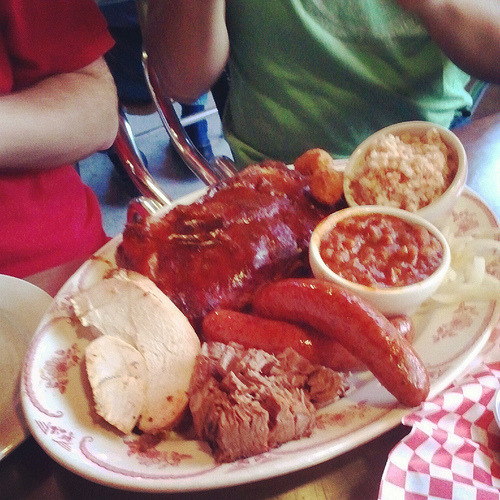 After all, Charlotte isn’t exactly known for great barbecue. But it opened in one of my favorite areas of town, Plaza Midwood, so I definitely had to give it a try. 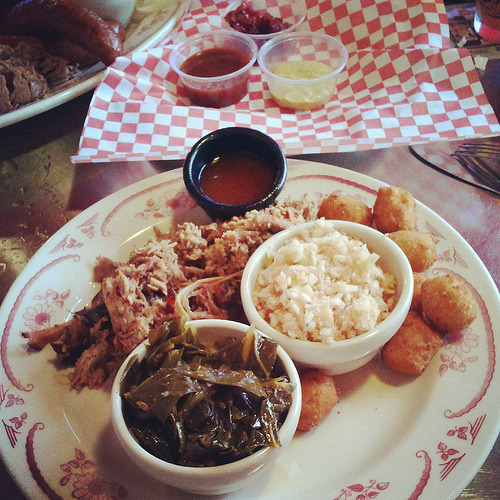 All my doubts were erased from the first meal there, and it’s been my favorite Charlotte barbecue spot ever since. Monk: May was “Bar-B-Que Month” at Midwood Smokehouse, and while I don’t particularly care for that spelling of barbecue, they had some great specials – Texas BBQ in week 1, Memphis ribs in week 2, and Kansas City burnt ends in week 3. Talk about great timing, week 4 happened to be East vs. West NC barbecue special – obviously right up the Barbecue Bros alley. And while Speedy and I had been to Midwood Smokehouse several times and considered it in our top 2 in Charlotte, this was the perfect time to go and write a review for the blog. Speedy: An interesting question that I’m not sure I know the answer to. Since it’s relatively new, I haven’t heard too many people talk about it that much, other than saying it’s good. Probably the pulled pork seems to be the most popular item, and my personal favorite. Anyhow, we arrived just before eight on a Friday night. Our party consisted of myself, Monk, Mrs. Monk, and my cousin Daniel, a foodie in his own right. Originally, we were told it would be a thirty minute wait, but someone must’ve told them that we were the Barbecue Bros and we weren’t messing around, we were seated after only 5. Monk: LIKE BOSSES. Weekend nights tend to be busy at Midwood, and that night the restaurant was definitely buzzing – all of the tables were filled, there was no available seating at the bar, and several folks were trying to find a sliver of room at the bar to order a drink while they waited for tables. Speaking of the bar, Midwood Smokehouse usually has a nice selection of craft beers available on draft and bottle as well as decent specials to go with it. And yes, you can go cheap if that’s the way you prefer your beer. As for seating, there is both indoor and covered outdoor seating, and even a second outdoor level (which I have not yet been to). We were seated outside in the covered area, just minutes after rainstorm had swept through and cooled off the night just a bit. Things were off to a good start. Speedy: Before long we were ready to order. We had decided that we would be able to have the biggest variety of meats if we ordered the East vs. West special and the combo platter which feeds 2-3 people, for Daniel, Monk, and myself to split. Mrs. Monk decided, however, to order a salad. ARE YOU KIDDING ME, MONK? YOU NEED TO GET CONTROL OF YOUR WOMAN. WHO ORDERS A SALAD AT A BARBECUE JOINT? Rudy: By “order a salad” you mean that she ordered extra slaw? Like her two side items were slaw next to the barbecue? Monk: I wish that were the case, Rudy. I think Mrs. Monk would defend her choice of salad by saying “but it had pulled pork on top!” but believe me when I say that we are working through these issues. But enough about our marriage, on to the barbecue. Monk: If you aren’t aware, eastern NC barbecue is whole-hog, chopped barbecue with a vinegar based sauce (sometimes spicy) while western is pork shoulders, pulled barbecue with a tomato-based sauce that gives it a reddish hue. Speedy: For some reason, the waiter felt the need to explain this to us like it was freakin’ amateur hour. Child, please. Monk: I mean, seriously. We are the Barbecue Bros! For this special, Midwood added Highland Gaelic Ale from Asheville, NC brewery Highland to the western sauce. The western was fantastic and blew the eastern out of the water head to head. The eastern was chopped a little too fine for my preference, giving it a somewhat weird texture. However, don’t get me wrong – it was still pretty good. Rudy: So the eastern would have been good by itself but when you ate it right next to the western, it was no contest, right? Monk: Yea, pretty much. This was the first time I had eaten the two head to head and the difference was eye-opening. Speedy: When ordering the brisket, we were asked if we wanted “fatty, lean, or a little of both.” Well, the last couple times I’ve had brisket, it’s been too fatty, so I ordered lean. This was probably a mistake. I’ll be the first to admit that I’m no brisket expert – that’s why we have Rudy on the payroll – but overall, I was a little disappointed. The brisket showed up chopped, not sliced, and was not really that flavorful. Adding some of the provided sauce helped, but it was still average brisket at best. Similarly, the turkey had a nice texture, but was dry and was also reliant on the sauce (or provided cranberry relish) for flavor. The ribs were better. 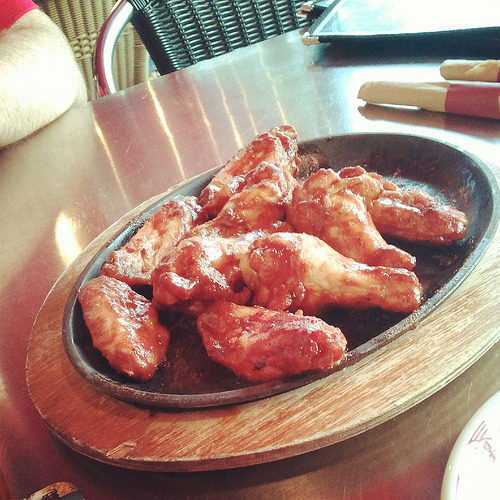 Tender and flavorful with plenty of sauce – I was definitely pleased with them. Monk: My favorite of the other plate was the ribs followed by the sausage. I gotta say, the more and more I have it, the more I love smoked sausage (keep your jokes to yourself). It will never displace pulled pork or maybe even ribs, but its a solid number 3 for me, jockeying it out with brisket. I also dug that Speedy had the wherewithal to order an additional half-basket of hush puppies, because I don’t feel right eating barbecue without them and they are decent here, if not a bit small. Rudy: I completely agree. I had not had smoked sausage until moving to Texas, and I love it. Some places will stuff them with jalapenos and cheese. My favorite types are the ones that kind of fall apart when you cut into them. That tells me they probably made the sausage themselves. Speedy: I would be remiss if I didn’t mention that the slaw here is excellent. Chopped fine with just the right amount of vinegar. No mayonnaise to be seen in this slaw. It’s tangy flavor rises from within. All in all, I love this place. 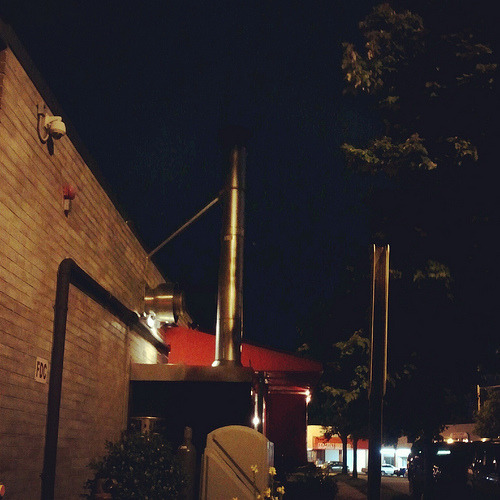 The atmosphere is good, the smoker on the side of the building is awesome, and the guys running the show actually know their ‘cue. I’ve never left Midwood Smokehouse without a full stomach and a smile on my face. 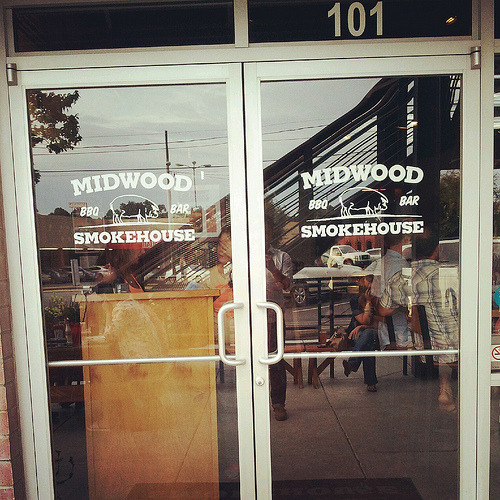 Monk: Agreed, Midwood Smokehouse is definitely my favorite barbecue spot in Charlotte. Their ‘cue isn’t amateur hour, and I especially dig the beer selection. Everyone I’ve taken to has enjoyed it, and it has become a dependable spot to take out of town guests. Also, that’s what she said! ← Since cole slaw is so awesome, why don’t they make cole cue? You know, barbecue with a mayonnaise based sauce. That would be the best barbecue ever! Pingback: Midwood Smokehouse, Charlotte NC – Marie, Let's Eat!